There are many joyful things about working at the Co-op, and one of the most joyful things that I get to do is coordinate the donations budget. I love giving money away, and I love that our members and customers provide us with the opportunity to support our community and the many frontline projects and non profits agencies that save lives every day. 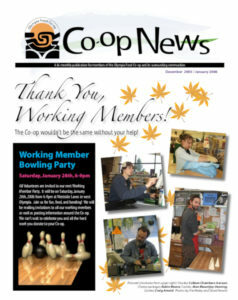 Every year, the Co-op allocates a certain amount of money in the operating budget to be used for donation. In profitable years, the Board of Directors also allocates 10% of the profits to community donations. This year, the operating budget included $5,000 for donation, and the Board will distribute an additional $9,4000. We also use a significant portion of our advertising dollars to sponsor community events and important community services. For the last several years, fundraising for non profits has been particularly difficult. Government social service programs get cut back further each year, creating a larger and larger demand for basics like food and shelter. In 2004, many good hearted progressives used their personal donations budgets on the presidential campaign. Immediately following the campaign season, the tsunami hit Indonesia. The fall, Katrina, Rita, and now, the horrifying earthquake in Pakistan have all created huge needs for financial resources. Gas prices are high, and dollars are tight. As local retailers face big box competition, even that pool of donation money has shrunk some. We feel very lucky and privileged to be able to continue to donate resources to our community and the world. I get 5 – 20 requests for donations every week. I slice our $5,000 budget as thin as possible. Some organizations get on going donations to support their kitchens, such as Media Island and the Safeplace shelter. We have donated to United Community AIDS Network, Bread and Roses, Stonewall Youth, Olympia Film Society Capitol Theater, Special Olympics, Fellowship of Reconciliation, Olympia Movement for Justice & Peace, Procession of the Species, Thurston – Santo Tomas Sister County Association, Projecto CIELO ESL classes, Evergreen Coalition Against Sexual Assault, LASO, Dispute Resolution, several schools and childcare centers, and many others. We also used this budget to match community fundraising events for Tsunami Relief, Katrina Relief, and Kashmir Earthquake Relief. We have used our advertising money to sponsor large and small community events, including the Bicycle Commuter Contest, Mud Bay Jugglers 25th Anniversary Benefit Show for Bread and Roses, Olympia Film Festival, and Olympia Teen Fest, to name just a few. We also underwrite local broadcast of Democracy Now! And support Works In Progress, Sitting Duck, the Senior News, the Green Pages, and many event programs with our ad dollars. With the exception of the disaster relief efforts, the vast majority of our donations are made to local organizations. Our budget is too small to make donations to individuals, so we work with organizations that work with individual needs. We do not donate to national charities with huge fundraising overhead, international fronts for the CIA, specific religions, and rarely donate to those “sexier” charities that have a much easier time raising funds. 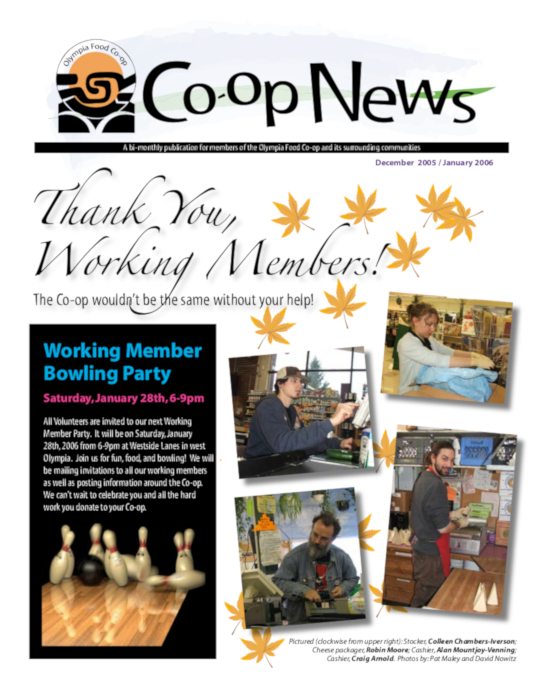 We’d like to take this opportunity to thank all of you for contributing to the Co-op’s financial stability that allows us to make these donations and support our community. We’d also like to thank the thousands of volunteers who donate their time to these incredible community organizations. You save lives every day.